1870 and earlier bars... Show yours! Bavaria is only slightly represented here. 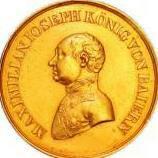 Therefore first a Bavarian medal for bravery (Typ 1a), so awarded for acts from 1806 - 1815 and lending for 1805. 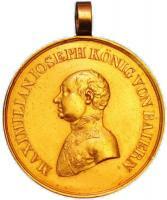 Here is a miniature chain of a brave Bavarian soldier, who stood in the field for Bavaria in 1849, 1866 and 1870/71. Hello Chris, the MVKs and MVOs were invariably handed out in cases. Reason for that was the return obligation. Thus, the MVOs and MVks were always stored safely and were rarely returned damaged. The blue bag would have to come from an EK or from an honor cross for front fighters The only option I see in a private purchase. Since the original would have been returned in the case after death and the privately procured piece could have been in a bag. Best regards Walter . A nice miniature. Thank you for showing me. Hello, I can not imagine that this MVO was delivered to Weiss so. It may be that he was later repaired and assembled incorrectly. I'll try it again. For gilded medallions or MVOs, the edge of the lower cross arm is widened on the back. As a result, it was immediately obvious that the 4th class of the MVO is not a real gold medallion or the 3rd class gold plated MVOs. In this example, the widening of the lower cross arm on the front can be seen. This should be correct on the back. As an example, I want to show the back of a MVO 4th class with silvered medallions from 1917 onwards. Here you can clearly see the broadening of the lower cross arm. Depending on the manufacturer, this is sometimes less pronounced. Left of the MVO with silver-gilt medallions from 1917 until the end of the war, on the right the MVO with three-part real gold medallions until the end of 1916. .